Thankfully I’ve stocked my freezer and pantry with healthier desserts and snacks to help me through this trying time and it’s WORKING! Oh and I almost forgot those little Girl Scout trolls have just started resurfacing with their delicious boxes of cookies and sweet smiles!! FML!!! Ok breath Monique. 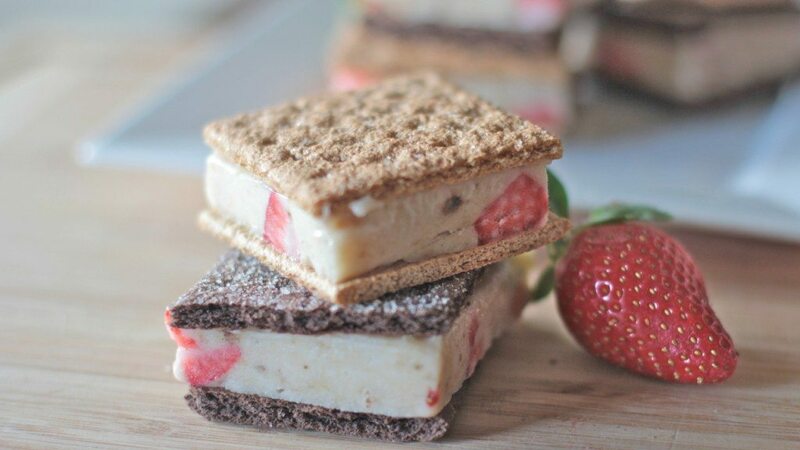 Like I was saying, I have some tricks in my own little bag, one of them being these healthy ice cream sandwiches. I won’t sit here and tell you they taste just like ice cream sandwiches or even better, because they don’t. They just aren’t those soft, chocolately vanilla ice cream bars of nostalgic heaven I grew up with. But they are a tasty little treat that won’t leave you feeling guilty after eating it and conquers the “sweets demon” like a pro. Enough for me. I’ll definitely continue making these. They rock! I really wanna try banana chocolate and banana peanut butter next. And peach banana. I hear that peaches also “cream” up when frozen and pureed so maybe I’ll try a peaches and cream batch as well. These babies will be my saving grace this summer I just know it! Hello felt stomach, my you sure look nice!! 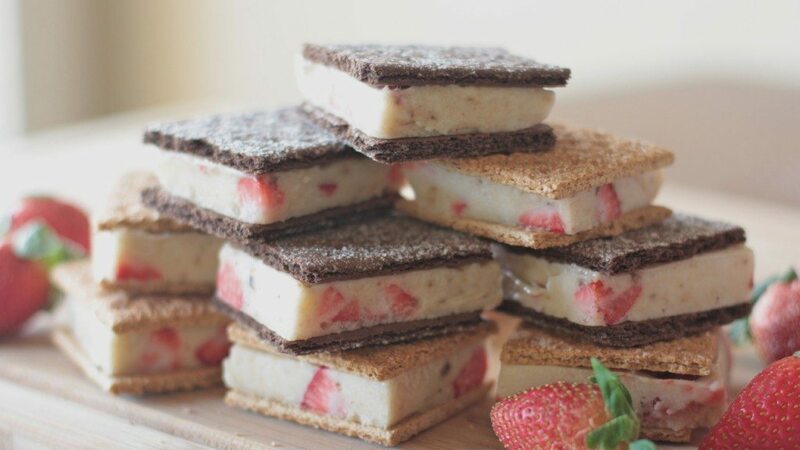 These health strawberry banana ice cream sandwiches are made simply with ripe frozen bananas that have been blended to create a creamy ice cream texture, a few fresh sweet strawberries sandwiched between two organic,natural graham crackers. 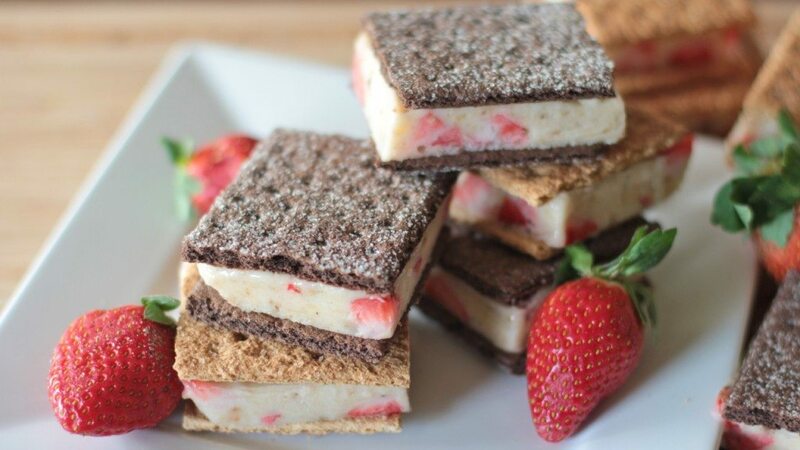 I like how clean these healthy ice cream sandwiches are. I can pronounce all of the ingredients. Win! 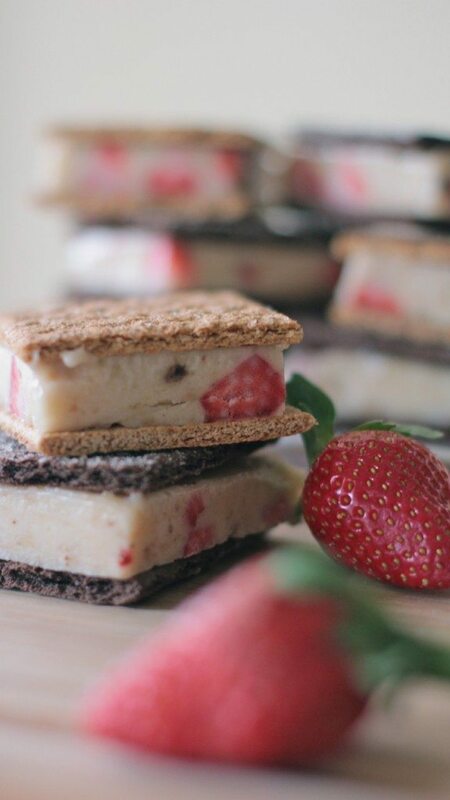 It’s super important that your banana and strawberries are really sweet for the best taste! 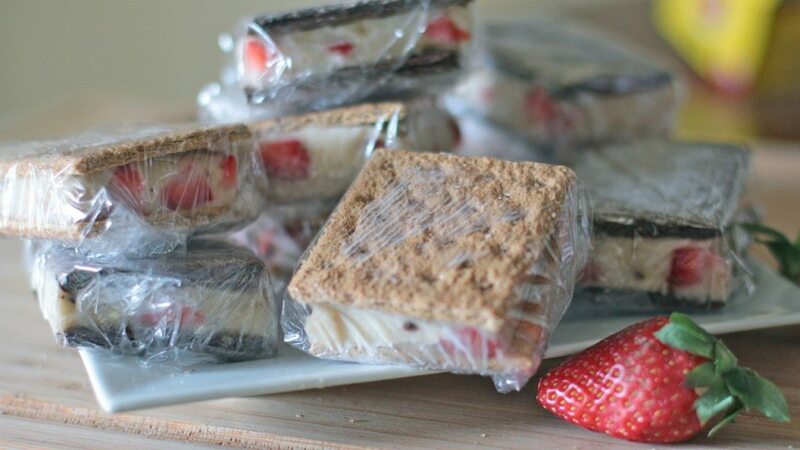 Make up a batch, wrap them in plastic wrap, place them in a freezer bag and stash them away in the freezer for when an ice cream attack hits. You’ll thank yourself. 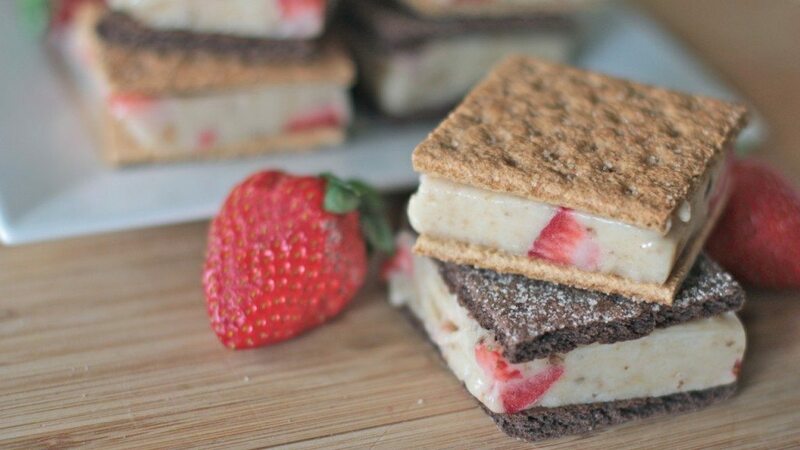 Watch me make these Healthy Strawberry Banana Ice Cream Sandwiches from start to finish! ****Update*** I made a batch of peanut butter banana and banana nutella today and they are by far my favorites so far!!! I’d recommend dividing the banana cream up so that you can make and taste a variety and pick your favorite to create a large batch. How did you make the peanut butter banana ice cream sandwiches? Yum! Is freezing the bananas first a necessary step? What would happen if you mashed the bananas, folded in the strawberries, then froze the mixture? Yes you must freeze the bananas first, it will not be an ice cream consistency if you mash them and then freeze them. You wouldn’t get the right texture. There would be no trapped air in the banana/strawberry mix.